Sales incentive contests are great ways to really motivate your sales team. But they will only work if designed correctly. The best way is to give all employees an incentive to increase their own personal sales and reach predetermined goals set for them. Your goal is to get Everyone to participate and Win! When correctly designed, your sales contests should actually pay for itself. 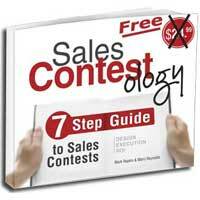 See this article and get our free eBook to help you design effective win-win sales contests. A successful sales incentive contest will improve individual performance and productivity, positively impact the morale of your entire sales team, increased sales revenue and allow you to achieve organizational goals in a short period of time. Here's some guidelines to follow when implementing a sales incentive contest. When contests reward each person based on exceeding their own individual goals, EVERYONE has a chance to Win! This method will have positive effects on your sales team by providing motivation amongst the individuals to improve sales results, impacting morale and employee engagement and increase profitability. Win-Win sales incentive contests will produce lasting benefits resulting in more engaged and effective employees who stay longer with your company. When designing a successful sales incentive contest, creating a list of objectives and goals that should be accomplished is the first step. Are you looking for sales contest ideas to increase sales revenue or profitability over a defined period of time, whether it is quarterly goals or exceeding numbers reached by a previous fiscal year? Maybe you looking to encourage the individuals to generate more leads or move a specific product line. Whatever the objectives may be, building a solid list is the first step in running a successful sales contest. Sales contests will vary from company to company but there are still three basic criteria that need to be defined. Decide the prize criteria, determining which targets and thresholds should be met or exceeded for one to earn a reward. An example of one prize criteria is the ability to increase new business by a certain percent or win back a previously lost account. Decide who is eligible for the sales contest. This is crucial in gaining acceptance. Decide if these sales incentive ideas are just for sales people, or will supervisors and support staff be included as well. Whatever the eligibility rules may be, just make sure they are well defined and fair for all. The length of the contest is very important if you expect to achieve your pre-defined objectives and expectations. Do not cut yourself short where meeting those objectives is impossible. When thinking of sales incentive ideas, do not create a lengthy contest that will require more resources to manage and decreased motivation and interest as time goes on. There are many sales contest prize ideas to choose from. 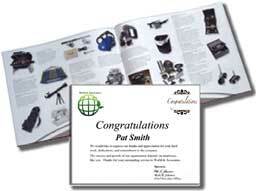 Some companies will choose to give cash prizes as sales contest rewards. Giving cash to a winner is simple, but not the most effective. Employees look at cash rewards as a way to satisfy their needs. Merchandise rewards satisfy your sales people’s wants as well as give them a sense of accomplishment every time they look at their prize. Select-Your-Gift's gift catalog Award Packets take it one step further by allowing each winning employee to pick a reward they can use and enjoy while still giving the manager full control over the price of each award - and their budget. When thinking of sales contest ideas, remember that using gift of choice award packets for sales prizes is the best solution for both the employee and the company. For more information read the following article Cash or Merchandise. Discover what an effective sales incentive contest can do for your company. If you’re ready to motivate your sales team to a higher performance and think of sales incentive ideas, download this free Sales Contests eBook today. You'll find a "turn-key" sales contest package that is easy to start and risk free. Contact our sales contest experts today to learn more about how a well-planned sales incentive contests can benefit your company. For more information please Request more information by clicking below.